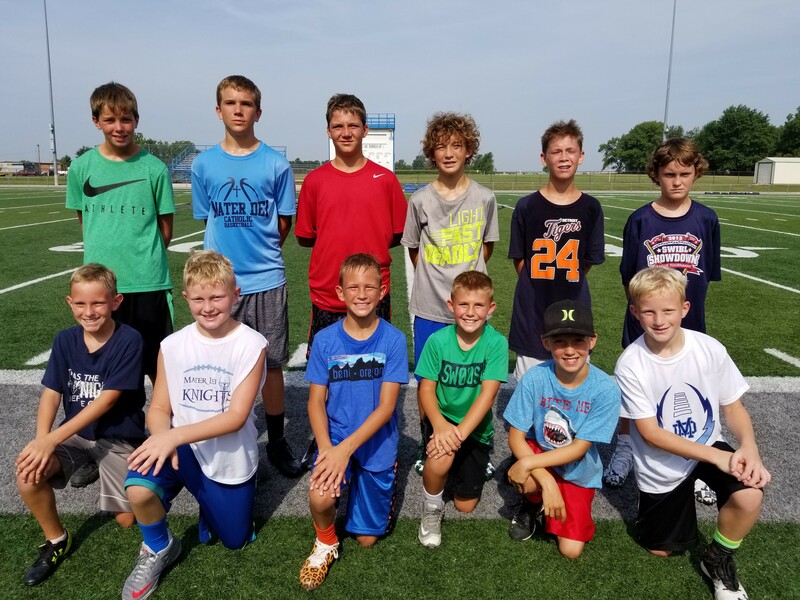 Eighty-nine third grade through eighth grade boys participated in Mater Dei’s Football Camp July 17-20. 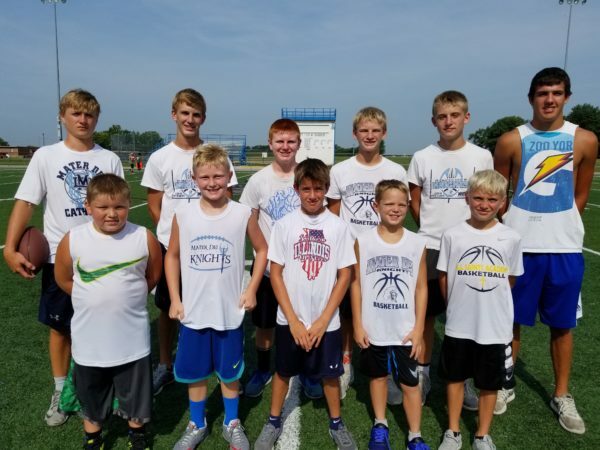 White Team, the 3rd – 5th grade passing tournament champion, included (front row, from left) Nolan Korte, Luke Brefeld, Gavin Peppenhorst, Jake Heinzmann, AJ Poettker; (back row, from left) team coaches (Mater Dei players) Nolan Poettker, Garrett Foppe, Kyle Billhartz, Nolan Foppe, Cameron Kreke, and Lucas Theising (head coach). 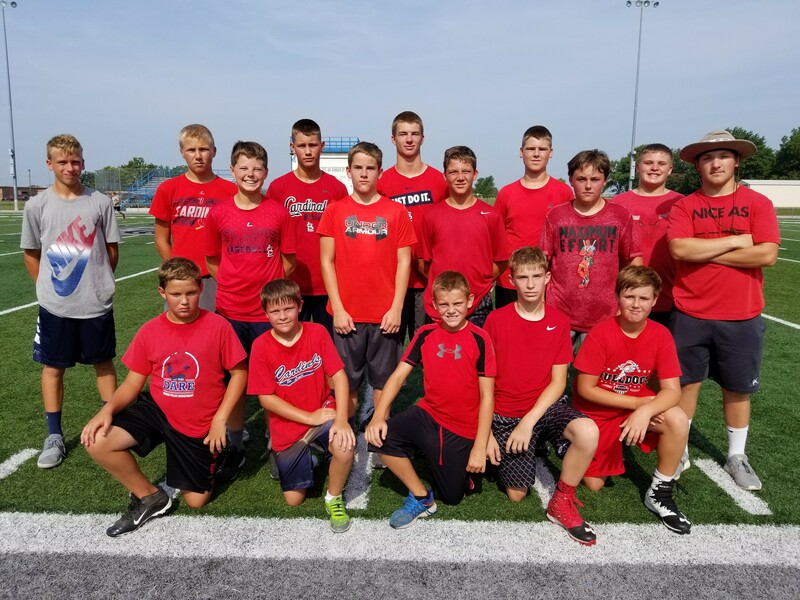 Red Team, the 6th – 8th grade passing tournament champion, included (front row, from left) Dalton Timmermann, Anderson Wilke, Jack Dierks, Logan Beer, Logan Langenhorst; (middle row, from left) Bryce Revermann, Luke Pingsterhaus, Reed Timmermann, Ian Simonton; (back row, from left) team coaches (Mater Dei players) Grant Cox, Tyler Jasper, Brock Timmermann, Logan Johnson (head coach), Nick Timmermann, Camden Snow, and Ebby Cox. 3rd grade kick competition winners (from left) Mater Dei freshman Parker Johnson, Bryce Toennies – 2nd place, Avery Strader – 1st place, Jack Reynolds – 3rd place, and Mater Dei freshman Collin McCray. 3rd grade pass competition winners (front row, from left) Avery Strader – 2nd place, Jack Reynolds – 1st place, Dylan Schomaker – 3rd place; (back row, from left) Mater Dei junior Nolan Poettker, Assistant Football Coach Glenn Monken, and Assistant Football Coach Randy Dooley. 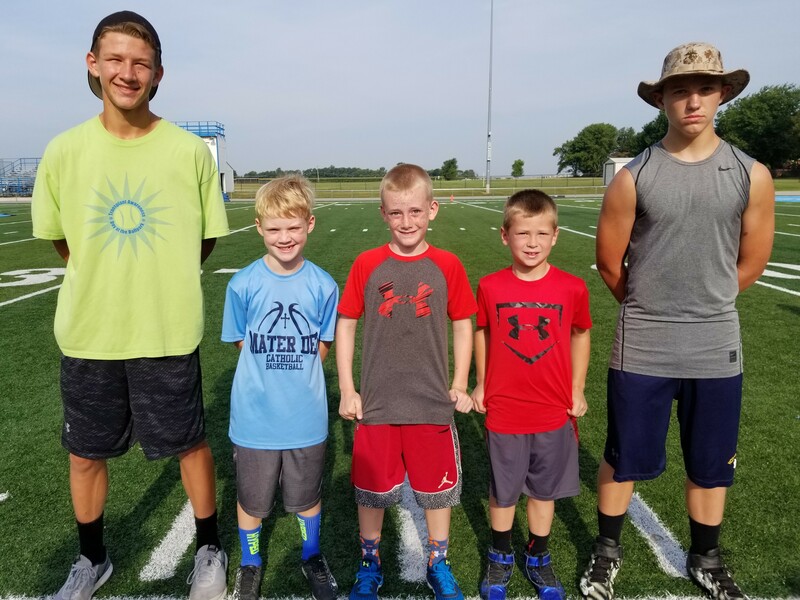 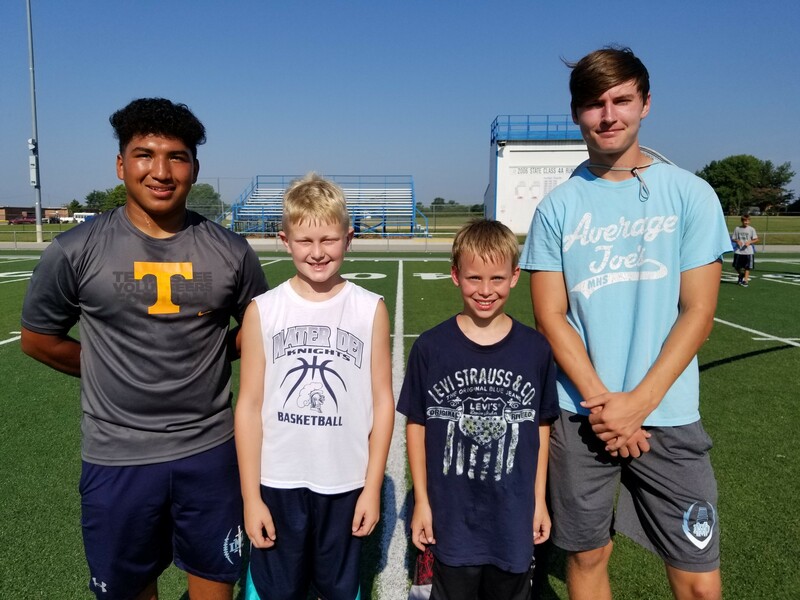 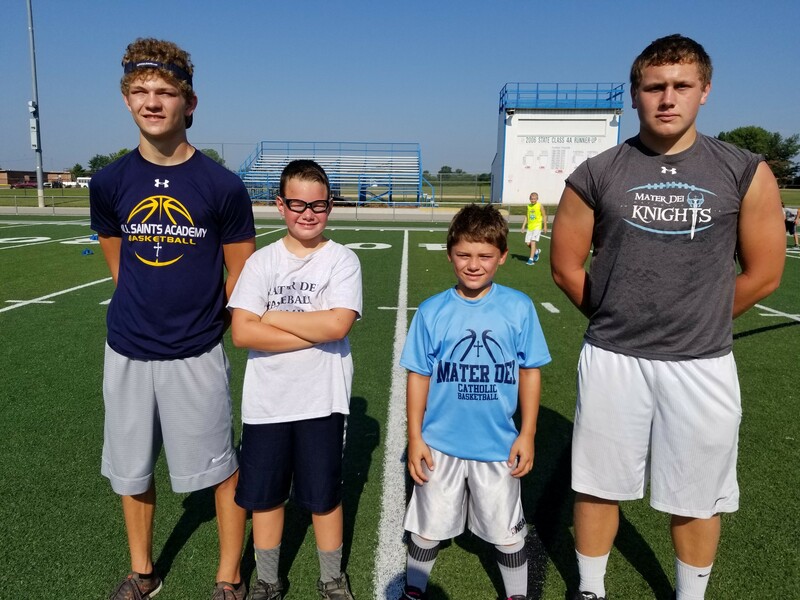 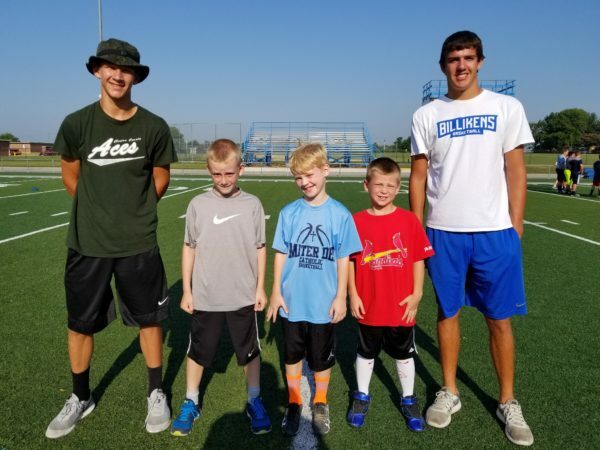 3rd grade punt competition winners (from left) Mater Dei freshman Parker Johnson, Avery Strader – 2nd place, Bryce Toennies – 1st place, Jack Reynolds – 3rd place, and Mater Dei senior Lucas Theising. 3rd grade sumo competition winners (from left) Mater Dei freshman Cameron Kreke, Jack Reynolds – 2nd place, Bryce Toennies – 1st place, and Mater Dei sophomore Avery Rudolphi. 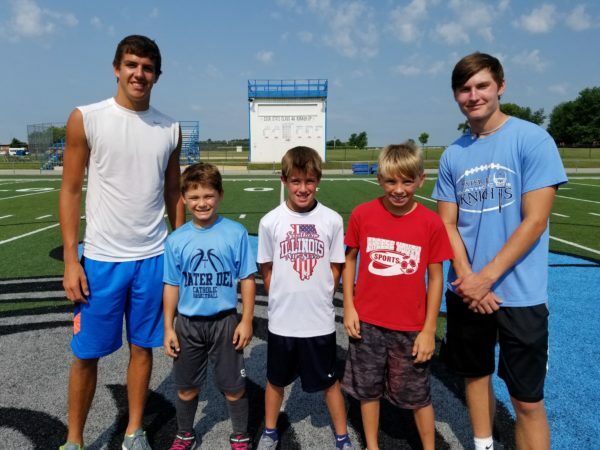 4th grade kick competition winners (from left) Mater Dei junior Nic Seelhoefer, Beckett Wade – 2nd place, Blake Gelly – 1st place, Gavin Peppenhorst – 3rd place, and Mater Dei junior Mitchell Peltes. 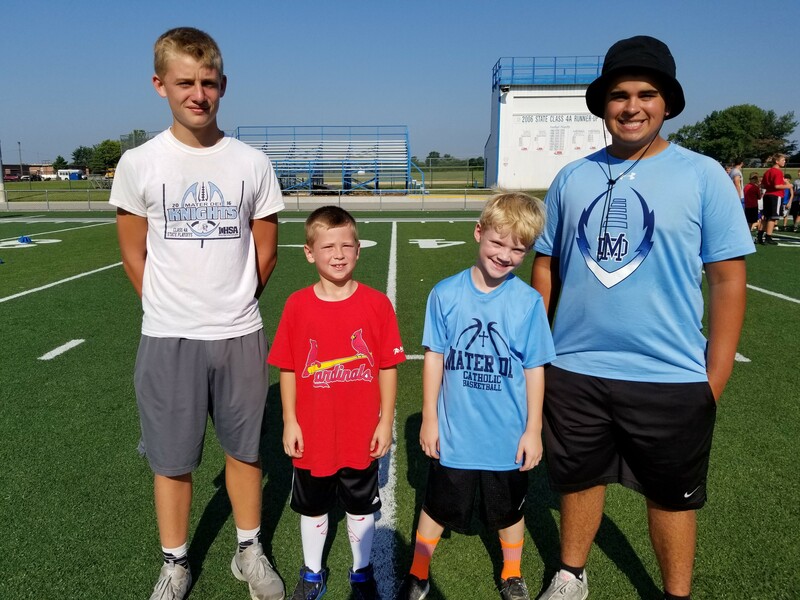 4th grade pass competition winners (from left) Mater Dei senior Lucas Theising, Blake Gelly – 2nd place, Gavin Peppenhorst – 1st place, Brett Hilmes – 3rd place, and Mater Dei senior AJ Albers. 4th grade punt competition winners (from left) Mater Dei junior Logan Johnson, Blake Gelly – 2nd place, Jaron Kampwerth – 1st place, Gavin Peppenhorst – 3rd place, and Mater Dei freshman Tyler Jasper. 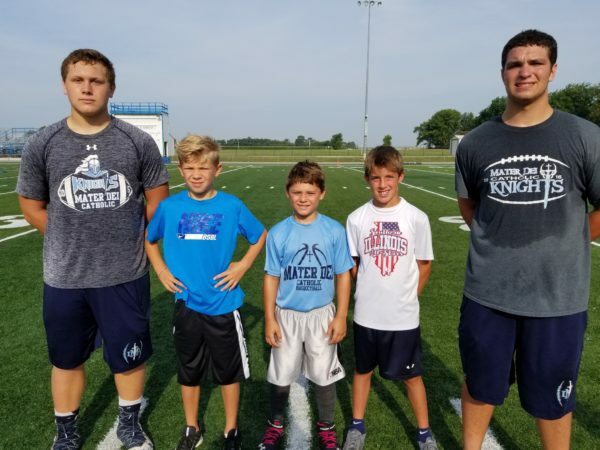 4th grade sumo competition winners (from left) Mater Dei junior Logan Ratermann, Jaron Kampwerth – 2nd place, Blake Gelly – 1st place, and Mater Dei junior Nic Seelhoefer. 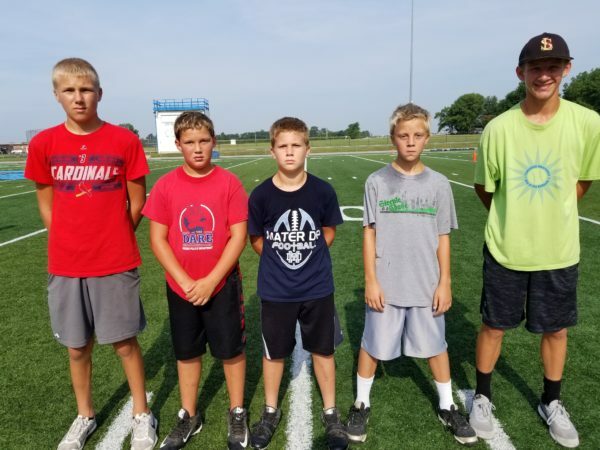 5th grade kick competition winners (front row, from left) Kaden Rakers – 2nd place, Parker Kampwerth – 1st place, Carter Murphy – 3rd place; (back row, from left) Mater Dei freshman Chris Kalmer, senior Lucas Theising, and freshman Harrison Mondt. 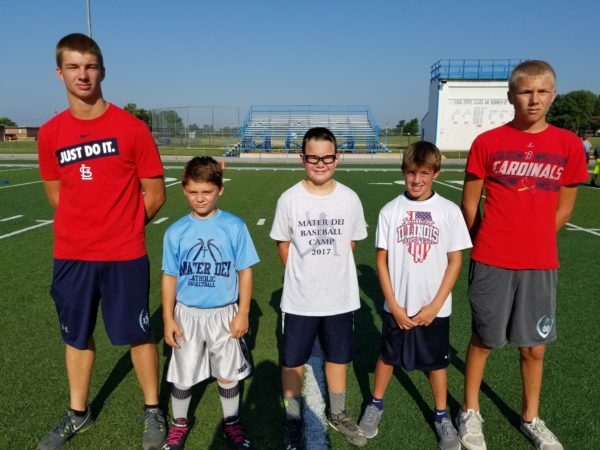 5th grade pass competition winners (from left) Mater Dei sophomore Caleb Gonsalves, Luke Brefeld – 2nd place, Carter Murphy – 1st place, Kaden Rakers – 3rd place, and Mater Dei sophomore Avery Rudolphi. 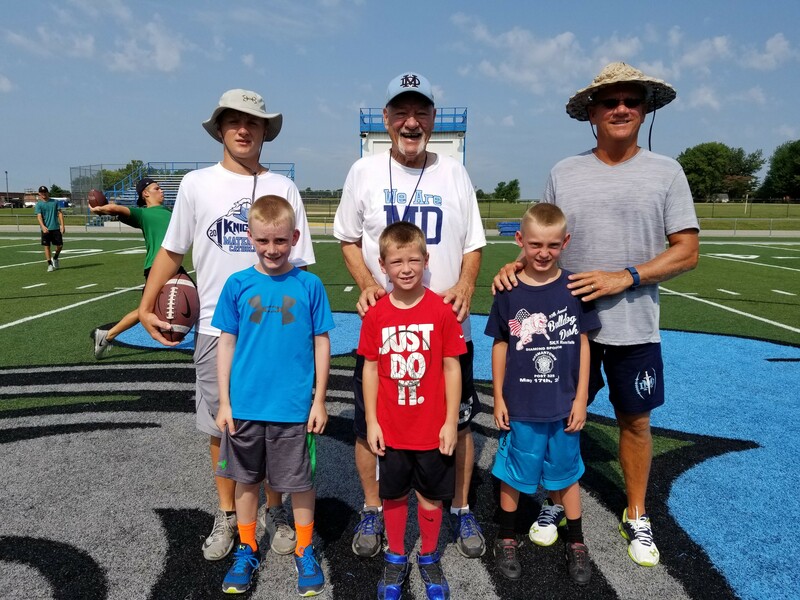 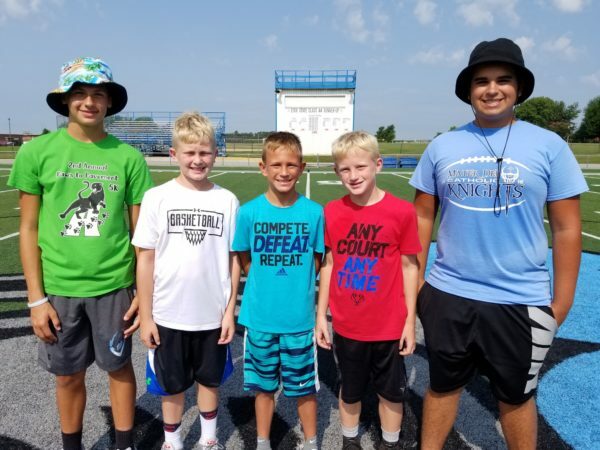 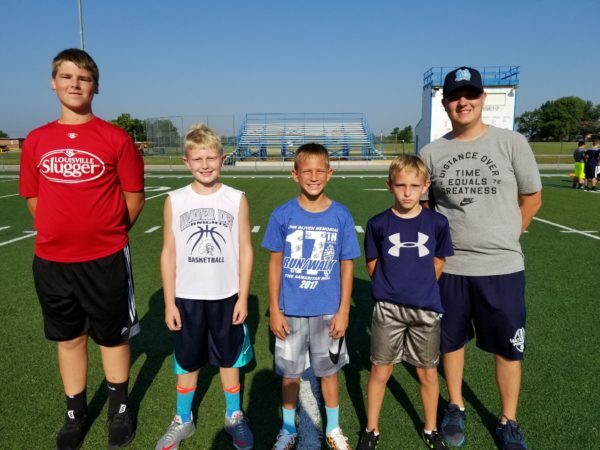 5th grade punt competition winners (from left) Mater Dei freshman Nick Timmermann, Luke Brefeld – 2nd place, Carter Murphy – 1st place, Camden Albers – 3rd place, and Mater Dei Assistant Football Coach Daniel Litteken. 5th grade sumo competition winners (from left) Mater Dei sophomore Riley Kohnen, Luke Brefeld – 2nd place, Ian Toennies – 1st place, and Mater Dei senior AJ Albers. 6th grade kick competition winners (from left) Mater Dei freshman Tyler Jasper, Dalton Timmermann – 2nd place, Markus Kehrer – 1st place, Daniel Goring – 3rd place, and Mater Dei freshman Parker Johnson. 6th grade pass competition winners (from left) Mater Dei Assistant Football Coach Daniel Litteken, Mater Dei junior Travis Jasper, Markus Kehrer – 2nd place, Ayden Kahrhoff – 1st place, Garrick Winkeler – 3rd place, and Mater Dei Assistant Football Coach Gregg Cox. 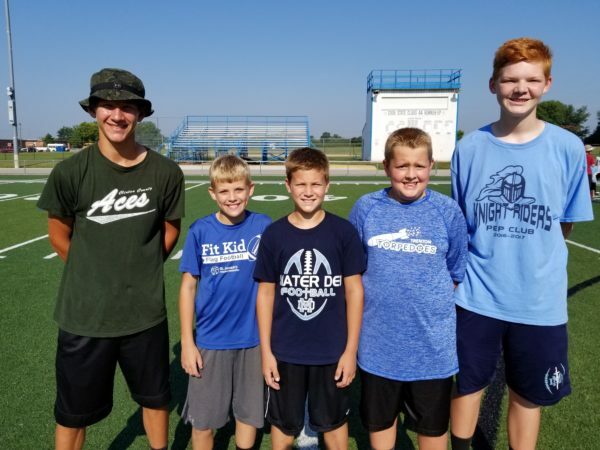 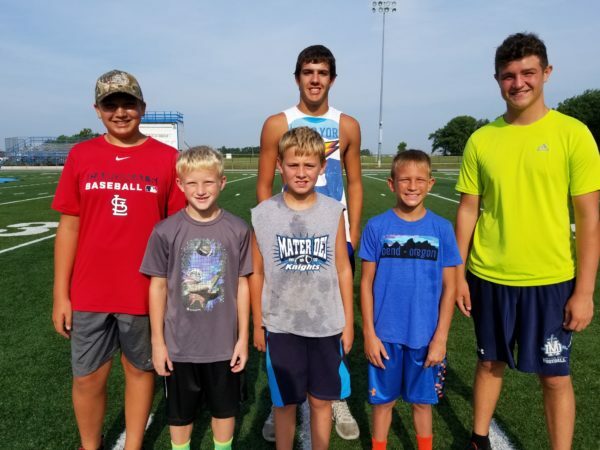 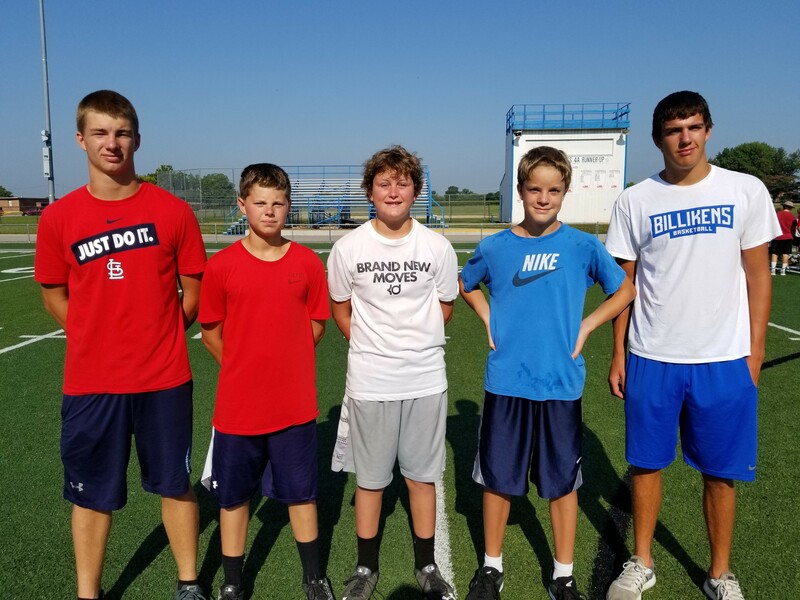 6th grade punt competition winners (from left) Mater Dei freshman Parker Johnson, Austin Gebke – 2nd place, Marcus Kehrer – 1st place, Evan Orr – 3rd place, and Mater Dei senior Drew Pollmann. 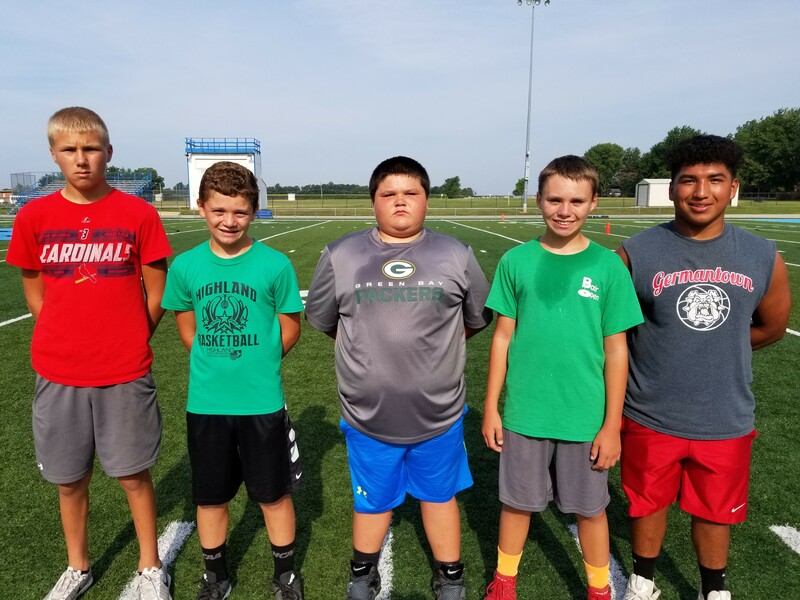 6th grade sumo competition winners (from left) Mater Dei junior Travis Jasper, Brock Revermann – 2nd place, Ayden Kahrhoff – 1st place, and Mater Dei freshman Grant Cox. 7th grade kick competition winners (from left) Mater Dei freshman Tyler Jasper, Brenden Gelly – 2nd place, Brayden Buehne – 1st place, Drake Rensing – 3rd place, and Mater Dei Sophomore Riley Kohnen. 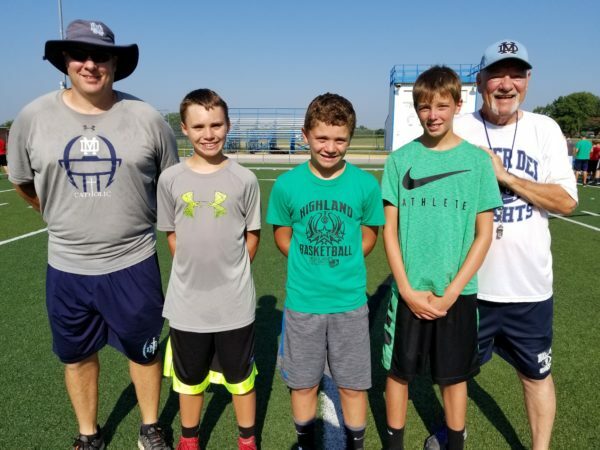 7th grade pass competition winners (from left) Mater Dei junior Logan Ratermann, Brayden Buehne – 2nd place, Brenden Gelly – 1st place, Seth Winkeler – 3rd place, and Mater Dei Head Football Coach Jim Stiebel. 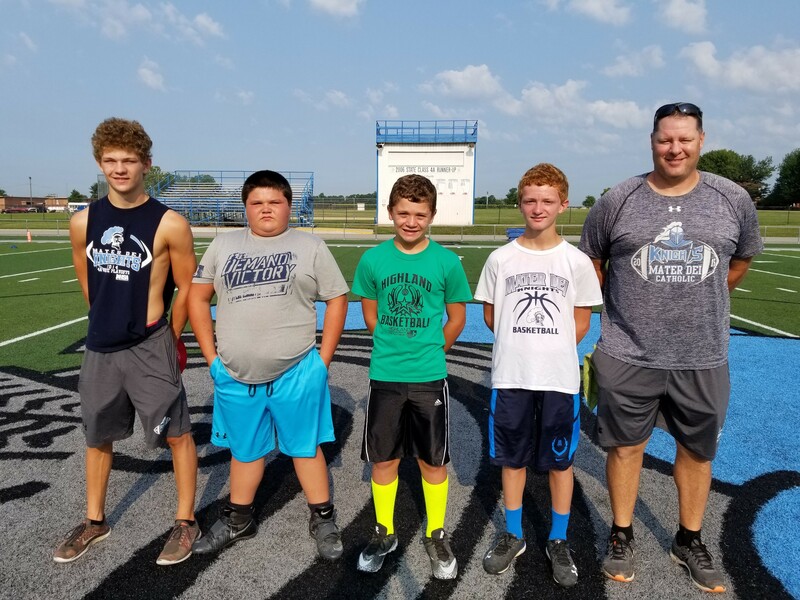 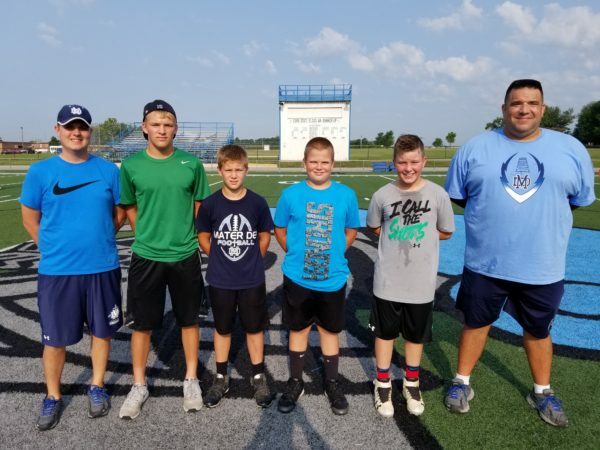 7th grade punt competition winners (from left) Mater Dei Head Football Coach Jim Stiebel, Drake Rensing – 2nd place, Brenden Gelly – 1st place, Cole Peppenhorst – 3rd place, and Assistant Football Coach Glenn Monken. 7th grade sumo competition winners (from left) Mater Dei junior Nic Seelhoefer, Carter VonBokel – 2nd place, Brayden Buehne – 1st place, and Mater Dei sophomore Ben Kassen. 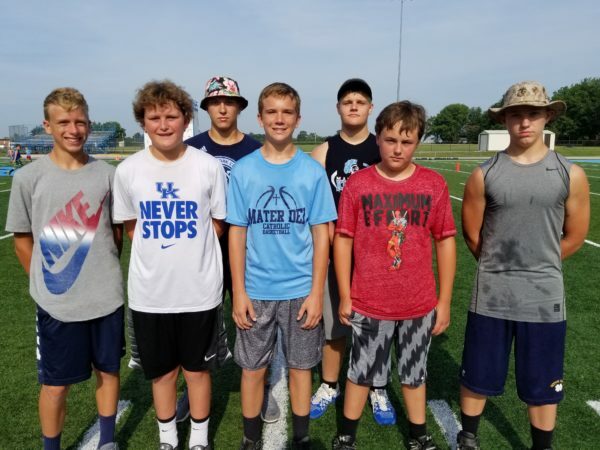 8th grade kick competition winners (front row, from left) Mater Dei freshman Grant Cox, Myles Kampwerth – 2nd place, Gavynn Baer – 1st place, Ian Simonton – 3rd place, Mater Dei freshman Collin McCray; (back row, from left) Mater Dei sophomores Ben Kassen and Bennet Krebs. 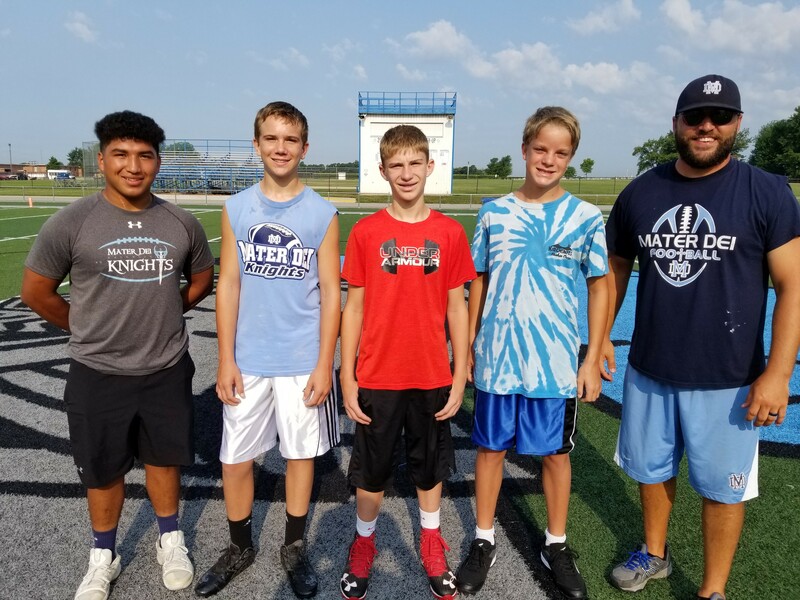 8th grade pass competition winners (from left) Mater Dei sophomore Riley Kohnen, Gavynn Baer – 2nd place, Logan Beer – 1st place, Joey Goring – 3rd place, and Mater Dei Assistant Football Coach Nick Hollenkamp. 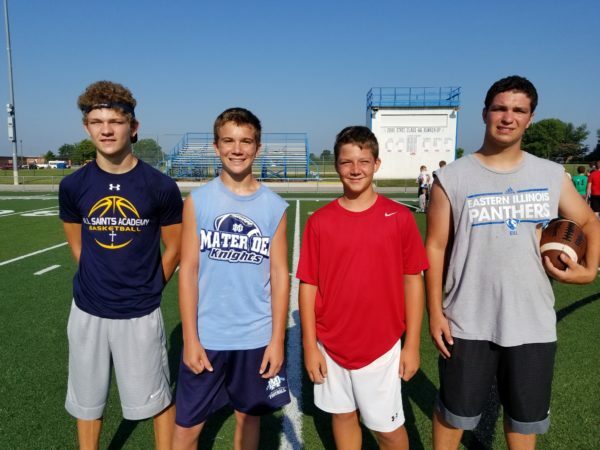 8th grade punt competition winners (from left) Mater Dei junior Logan Johnson, Bryce Revermann – 2nd place, Myles Kampwerth – 1st place, Joey Goring – 3rd place, and Mater Dei senior Lucas Theising. 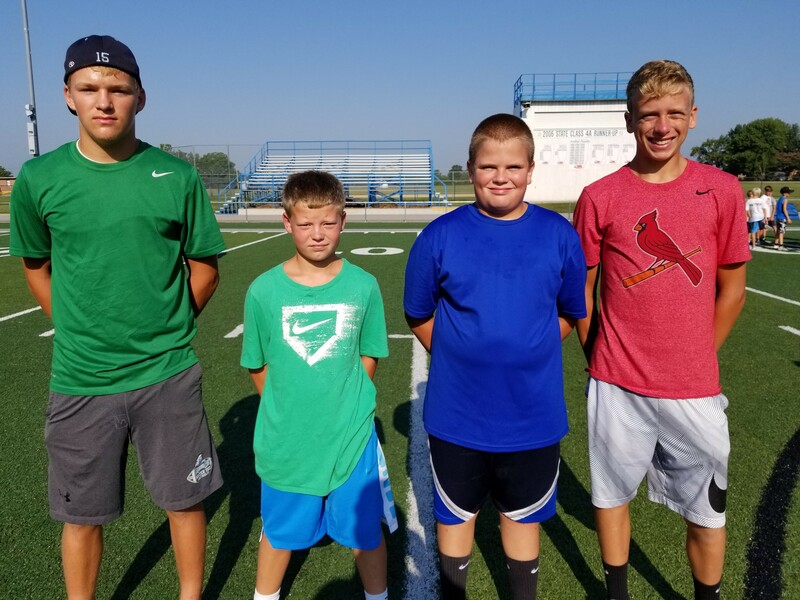 8th grade sumo competition winners (from left) Mater Dei junior Logan Ratermann, Gavynn Baer – 2nd place, Reed Timmermann – 1st place, and Mater Dei junior Mitchell Peltes.